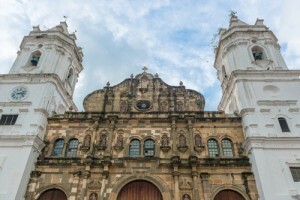 La Catedral Metropolitana or Catedral de Panamá, is one of the largest churches in Central America. Construction was thought to have begun in 1668. The Baroque architecture style is represented in this structure. It was completed in 1796 and in 2003 underwent a massive restoration project. Today it overlooks the Plaza Catedral (Plaza de la Independencia) and is one of the main areas in the historic district Casco Viejo. There are 2 towers on either side of the main entrance’s wooden doors. The towers are magnificent structures, encrusted with mother of pearl from the Pearl Islands. The interior of the cathedral is vast and gorgeously appointed inside. Its adornment is muted contrasted with its ornate exterior towers. The alter is adorned with marble, however. Make plans to stop by and tour the grounds, if you are in the area it’s definitely worth a visit. People may go inside the church and read the history. Inside the foyer is a wonderful exhibit area filled with historical items as well as the history of the church and evidence of the important role that Christianity has played in the colonization of Panama.